The Britax Parkway has been an outstanding booster for many years. The latest versions are the Britax Parkway SGL and Parkway SG. The difference between the two being a $30 price increase for the SGL model that includes LATCH attachments for securing the booster to anchors in most newer vehicles. This is a review of the SGL model, but most comments apply to the SG model as well. We previously reviewed the original Britax Parkway SGL Booster, introduced three years ago. Both the original version and this newer version have a Best Bet booster rating from the IIHS. For the most part, the specifications remain largely the same for the Parkway SGL. The weight rating is 40-120 lbs. Kids may use it in high back mode if they are between 38″ and 63″ tall. (For backless mode, this depends on the vehicle’s head restraint for height limits). The seated shoulder/torso height can accommodate kids from 15″ to 21.5″ tall. The SecureGuard crotch strap depth also remains the same at 7.5″. All identical to the original Parkway SGL. Britax specs indicate that the new SGL is slightly wider and heavier than the previous version. I can confirm that it is a fraction of a pound heavier, but I find the base measurements to be about the same all around. The increased width is at the shoulders, due to the design of the higher side impact protection wings. Below are some comparison photos of the previous Parkway SGL (left side of each photo) and new Parkway SGL (Right side of each photo). In frequent use over the last two months, I’ve found the new Parkway SGL to fit my 8-year old son very well. He is around 53″ tall and close to 63 pounds. He generally still requires a booster, because he does not quite pass the 5-step Test for seatbelt fit in most vehicles. In both our 2010 Toyota Prius and 2011 Toyota Highlander, I found the belt fit to be very good in most seating positions, whether used as a high back booster or backless booster. The lap belt fit flat on his upper thighs, while the shoulder belt remained nicely centered on his shoulder with the height adjusted correctly. Of course, the design of the base and shoulder belt guide of any booster may work better in some vehicles and some seating positions than it does in others! For that reason, it’s always best to first try any booster in your own vehicle, with your own child and also be sure to get a good return policy when you buy! 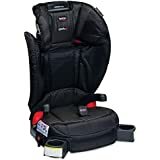 We also appreciate that Britax does not allow the use of the Parkway boosters for kids under 40 pounds, in either high back or backless mode. In highback mode can be used in seating positions that do not have a head restraint or in cases where head restraint needs to be removed to allow booster to be flush with vehicle seat. Overall, the Britax Parkway SGL is a nice update from the previous model. Many of the changes appear to be in direct response to customer feedback! I have found no major complaints (outside of the minor disadvantages listed above) so far about the improved design. If you have a squirmy kid like I do, you may also appreciate the unique SecureGuard clip that provides one extra point of restraint to help keep them from sliding under the lap belt, even if they’ve moved around a bit. The Parkway SGL has an MSRP of $159.99 and the Parkway SG is $129.99, but prices are already dropping on Amazon.com now that several fashions are in stock! The new Parkway SGL is a great booster and I’ve been using it daily for almost two months now with no complaints from my son in regard to comfort or fit. And when you’re in the car, a happy child is a happy driver! Thank you to Britax USA for providing the updated Parkway SGL used for this review. No other compensation was provided. All opinions expressed are those of CarseatBlog. How is the booster seat cushion? My son complains of discomfort with no padding. Hi Rosanna, the Parkway SGL has a layer of comfort foam underneath the bottom portion of the cover so comfort should not be an issue. HTH! I recently replaced my three 2012 Britax SGL high back boosters for the new & improved 2013 versions. What an improvement! They are nicer looking, better padded, WAY better “wings” on top and bottom, cup holders open easier (the old ones were super hard to open) and the seat belt guide keeps the belt a lot straighter without all the bunching and scrunching up like on the old models. I ordered the Peg Perego high backs thinking they’d be so great, but they can’t even compete with the Britax boosters, and they are $200! I returned them for the Britax and I couldn’t be more pleased. My 5,6 and 7 year olds say they are so comfy! Do you know if the new belt guides make this seat work with a 2008 grand Caravan in the 3rd row? I just ordered a Vivo, but I’m concerned about the longevity of that seat and heard this one might work well with the changes. Thanks! It all depends on the car! For example, on the previous Parkway, the belt always managed to work its way out of the guide in the third row of my Highlander, but I’ve never had that issue in our Prius. I need to try the new one in the third row for daily use to compare. The fit was good, but only until it came out of the guide lol. Thank you for clarifying! We had issues with the shoulder belt fit in the old parkway. I wodner if this would be any better. Hi Jessica- good catch! I should have removed the head restraint for a better fit. The backrest appears to be flush against the vehicle seat back once he is in the booster and the LATCH is tightened, so I’m not sure if that would be an issue in regards to the instructions, but probably preferable to remove it. I’m curious if that gap between the bottom of the head rest and the back of the parkway is ok? Im really impressed how quickly he buckles himself! I love it. It’s a tight race between this and the Turbo with SS. I can’t make up my mind! The head wings are not much deeper, if at all. The torso wings are deeper at the top. The overall width of the base is the same, but I didn’t see if the cupholder area protruded more at the corners. I can check on this. It looks a little wider at the corners of the front of the seat pan too? Overall, I like the look-but it’s probably not tall enough for my second to use much longer, lol. I wish they would rate this seat for below 40# like several other boosters. It looks so nice and has so many great features I love. Unfortunately, at 33# and 5 years old, my DD will probably not hit the 40# mark until 7 or 8 years old, which is well after the time frame I’d like to start boostering (around 6 yo). I wish they would release some numbers on how much the safe cell reduces head excursion. I like the idea of it, but I wonder if it’s really necessary to replace my 7yo’s booster to get Safe Cell. I’ve been waiting on this review. 😉 I really like the idea of Safe Cell and the deeper sides. Now, if DD would just stay at 40# consistently we could try one.